These two figure ground and spatial reasoning activities are free from the Crocodiles, Flamingos and Monkeys Visual Perceptual packet. Can you count how many crocodiles are in the picture? This figure ground activity can be printed to provide your students with a visual perceptual challenge. Can you use spatial reasoning and visual motor skills to complete the monkey picture? DOWNLOAD 2 FREE Figure Ground and Spatial Reasoning Activities. 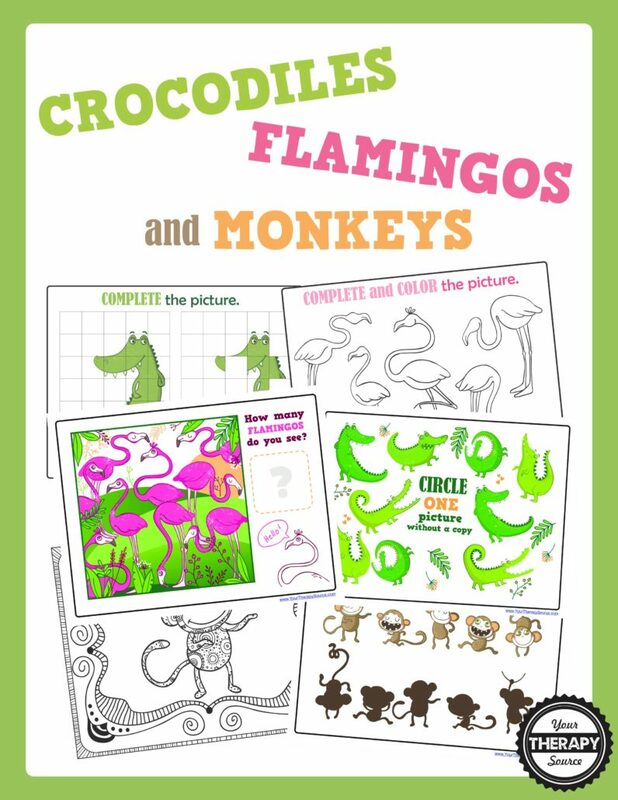 Crocodiles, Flamingos and Monkeys Visual Perceptual Packet – This digital download includes 22 pages of worksheets to practice visual discrimination, spatial reasoning, figure ground, visual closure, form constancy, visual motor skills and coloring. FIND OUT MORE INFORMATION.